You can never have too much stationery! In today’s tutorial we have come up with creative ways to keep your stationery supplies neat, tidy and crafty! We have transformed a pringle tube into this beautiful stationery pot. Cut your tube down to 11cm in height then cut a piece of patterned paper approximately 7cm x 10.5cm and stick to the tube using double sided tape. Cut a piece of patterned paper 10cm high and long enough to wrap around the pot, cut a 5.5cm slit in the centre of the paper then gently curl the edges back to create an opening, stick to the tube ensuring the slit is matched up with the patterned paper you previously fixed to the tube. Create a border for your pot by sticking lace on the top and bottom, using double sided tape. We have decorated the centre of the pot with a row of adhesive pearls. To embellish your pot, curl two small pieces of floral wires and stick with the paper flowers at the centre of the slit to create a bursting floral effect. We have then cut out leaves and tucked these under the paper flowers. To finish, decorate your pot by using the small Fiskars Squeeze Butterfly Punch and add an adhesive pearl to the centre of each butterfly. Why not jazz up your office diary using decoupage papers? We have used the First Edition Deco Mache coastal town paper to cover this A5 diary. Read our recent how-to guide for deco maché to learn more. You can personalise your stationery essentials with embellishments. We have used a range of pretty ribbons to tie bows to the top of the paperclips. We have also used a glue gun to add resin flowers, buttons and metal charms to our stationery basics. Washi tapes are great to use inside your diary! 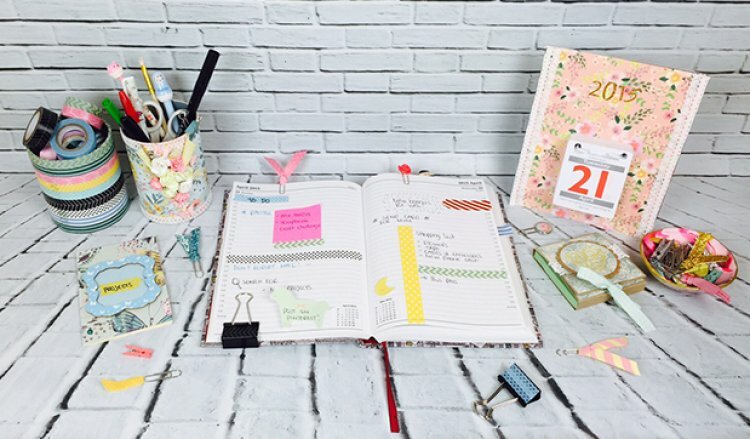 Simply add strips of washi tape to a diary page to create dividers or write yourself reminders. You can also use washi tapes as side tabs to find individual pages more easily. Make your post-it notes truly unique with this easy tutorial. Cut a piece of Dovecraft A4 Kraft Card by 20.8 cm x 7.5cm. Score and fold your rectangle at 7.5cm, 8.5cm, 16cm and 17cm. Place your 7.5cm post-it notes in the centre of the card paper card with double sided tape. To create a ribbon tie for your notepad, cut two ribbons by 17.5cm and 14cm. Stick the longer ribbon on the top fold of your notepad and cover with a 7.2cm square piece of patterned paper; do the same for the smaller fold and cover with a 7.2cm x 3cm piece of the same patterned paper. These would make great gifts for friends. In the centre of the pad, we have placed a band of 7.2cm lace. To create a feature for the front of your notepad, we have cut a scalloped circle using the Squeeze XLarge scalloped circle punch and stuck it on top of the lace using 3D foam. Layer your scalloped paper with a circle piece of paper. Decorate your notepad with a First Edition heart lock die or 3 layered die cut flowers with an adhesive pearl centre. Great for writing To-Do lists and personal reminders, you can make these cute project mini note books easily. Cut a piece of the First Edition Paper Flowers 6 x 6 Paper by 15.7cm x 10cm and fold in the centre to create the cover for your mini note book. Cut several sheets of coloured paper by 15.7cm x 10cm, again folding in the centre. Using a sewing machine, sew the centre fold to ensure your papers stays in place with a basic stitch. Create a personalised finish to your mini project note book by cutting a contrasting piece of paper by 5cm x 5.5cm and sticking to the centre of the cover. Place a wooden frame over the paper to create a border for your front cover. We have then added a strip of washi to the centre of wooden frame to write text over it. Make everyday a delight with this transformed daily desk calendar. We simply cut a piece of First Edition Paper Flowers paper to make a 14.7cm by 18.5cm rectangle. Remove the date paper block so you can cut out slits for the metal grips and cardboard holder. Once you have done this, stick the paper to the card base using double sided tape and decorate with a lace border. As a finishing touch, we have added the year using Dovecraft glitter stickers. Have you been inspired by our crafty stationery tutorial? Remember to share your latest creations for your office or craftroom in the project gallery.